My favorite time of the week!! #SundaySupper time! When this weeks theme came up I think I may have been the first one with their hand up to be a part of this awesome party! With the holidays being crazy busy and us in the middle of the biggest move of our life I knew committing to this event would be difficult but I had to! It’s Emeril! I was more than thrilled when I received a copy of his Serious Sandwiches book because most of my kitchen stuff is packed and well Sandwiches was exactly what I had on my mind. As I made my way through the book not only did my mouth start watering but I couldn’t believe how many sandwiches could really be a “whole meal!! !” I love sandwiches, I always have, but just like every other person out there I get sick of them, but this book……….you are going to want to try this one because you can make every one of these sandwiches a meal and then some! Our founder of #SundaySupper, Isabel over at Family Foodie has personally met Emeril, interviewed Emeril, and has made many many of Emeril’s recipes before! I for one am hopping on the band wagon and joining her on this journey because there is nothing I enjoy more than cooking recipes from any successful chef out there. I have to admit when I first started cooking I duplicated, whipped up, conjured many of famous chef’s recipes, then I got more into blogging and started to make my fellow blogger’s recipes, now I need to find a middle ground because I miss my favorite chef’s! 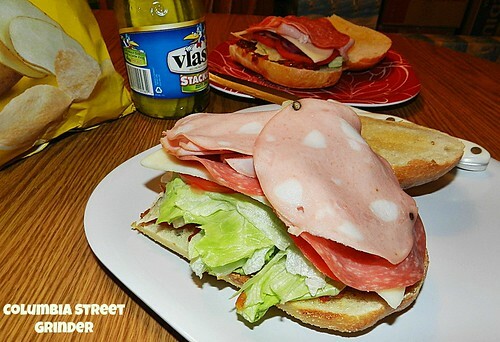 I have to admit, I wasn’t sure about this sandwich but it was a busy day at my house and we needed something filling but quick…..I was VERY happy with the lunch we had that day! Even my husband said, “this is a good sandwich!” I toasted the bread and it just made the sandwich! Join me and the #SundaySupper crew as we create some of Emeril’s recipes from two of his hit cookbooks! 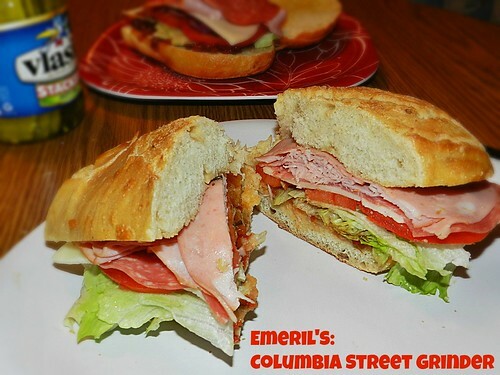 One, Emeril’s Pot Luck, and the one I received, Emeril’s Serious Sandwiches! Click directly on the picture for a link to buy one or both of these books! You are not going to want to miss our chat this week because if your there, you could win one of these amazing books and cook right along with us! Have you ever made a recipe from Emeril? Please join on us on Twitter throughout the day during #SundaySupper on December 30th. 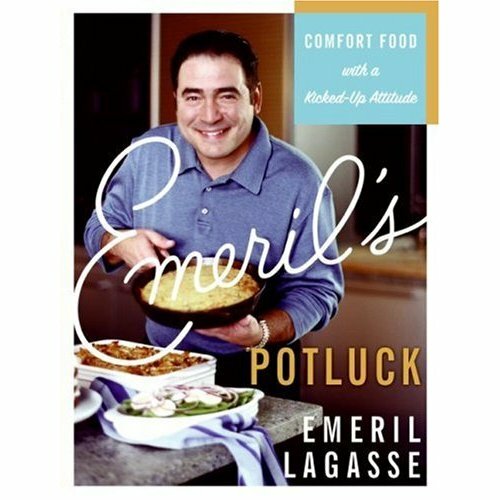 In the evening we will meet at 7pm EST for our #SundaySupper to talk about these fabulous cookbooks and Emeril himself. We are so excited to have you join us. 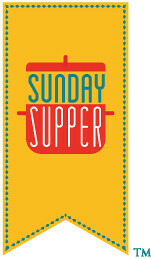 All you have to do is follow the #SundaySupper hashtag or you can follow us through TweetChat. Please feel free to share with us and our followers your favorite Emeril recipe on our #SundaySupper Pinterest Board. We are excited to have you Around the Family table this week! 1. Cut the loaves of bread in half lengthwise, and arrange them in a single layer, cut sides up. Liberally brush the bread with the vinaigrette. On the bottom half of each loaf, evenly layer one-quarter of the provolone, followed by one-quarter of the mortadella, one-quarter of the spicy ham, and one-quarter of the salami. Top with 2 slices of tomatoes and 3 slices of onion. Divide the cherry peppers among the sandwiches. Stir the vinaigrette and generously drizzle it over the onion and tomato. 2. In a small bowl, toss the torn lettuce with some of the remaining vinaigrette. 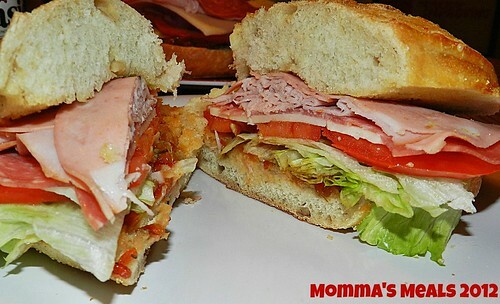 Divide the lettuce among the four sandwiches, top with the other halves of the bread, and serve. 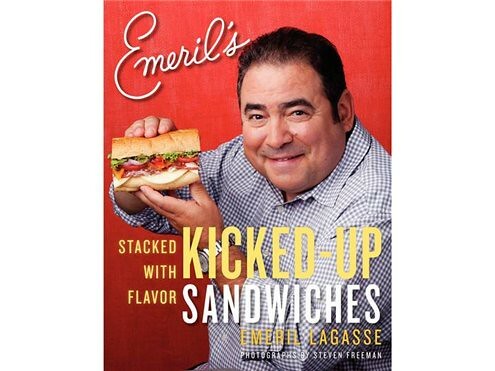 25 Bloggers will be giving away 25 copies of Emeril’s Cookbooks! * You don’t want to miss this special Celebration! Oh my goodness, those meats, the cheese, and most especially that vinaigrette. AMAZING! I love that you toasted it, and that you were skeptical 😉 Proved ya wrong, did Mr Lagasse? Added to my must try SOON! Looks like a meal and a half! Wow what a sandwich! What a beautiful looking sandwich!!! Not a comment on the recipe, but a general comment. You said that once you became a food blogger, you began using fellow bloggers recipes instead of using famous chef’s recipes. Why? But, it does explain why everyone seems to make the same thing or almost the same thing all the time. I’m not a food blogger, so it doesn’t make sense to me that you would need to make recipes from other bloggers. I know that many food bloggers do it. How does someone get to be the one that is copied? I started making other food blogger recipes because 99% of all the food bloggers I follow do such a great job making their dishes look amazing, so amazing that I want to try them all the time! It’s also a great way to support other food bloggers, when I recreate someone’s recipe I always link back to their log as the original creator. Just personal opinion I guess, no rhyme or reason as to who I choose, I just go on the dishes my family and I would enjoy! 🙂 Thanks for stopping by! All I can say is this is my kind of sandwich! I could probably eat it every single day. I want that vinaigrette!!! YUM! This sandwich was seriously an amazing combination of flavors, am I right? I made one for my dad when he was over at our house helping me with something, and he devoured his in seconds! That vinaigrette sounds amazing! Can’t wait to try it. Just fabulous, just like you! It has been such a pleasure getting to know you and your family this past year… I look forward to many more #SundaySupper events this upcoming year! Happy New Year! This looks like one outstanding sub!!! Stack with all sorts of yummy ingredients!!! Happy, happy New Year! Weren’t these sandwiches delicious!!! I love that you added some pickles on the side. Can’t have a sammich without those! Happy New Year! It’s dangerous to go through everyone’s posts right before dinner – I’m starving here staring at your photos! This sounds like a divine sandwich – so full of flavourful ingredients. Happy New Year! I am really excited to try this sandwich. Sounds amazing. Look at all of that glorious meat! This is one scrumptious looking sammie. Happy New Year! Awesome pics! This sandwich is seriously amazing. The addition of the Balsamic-Herb Vinaigrette just knocks it right out of the park. Thanks for posting! Happy New Year!